1.20/1.25m Junior/Amateur Individual Medalists Elese Kirby, left, Anika Pirkle, center, and Molly Struve, right, who earned Gold Star Emerging Jumper Rider titles. Photo credit: Kristin Rover/USHJA. 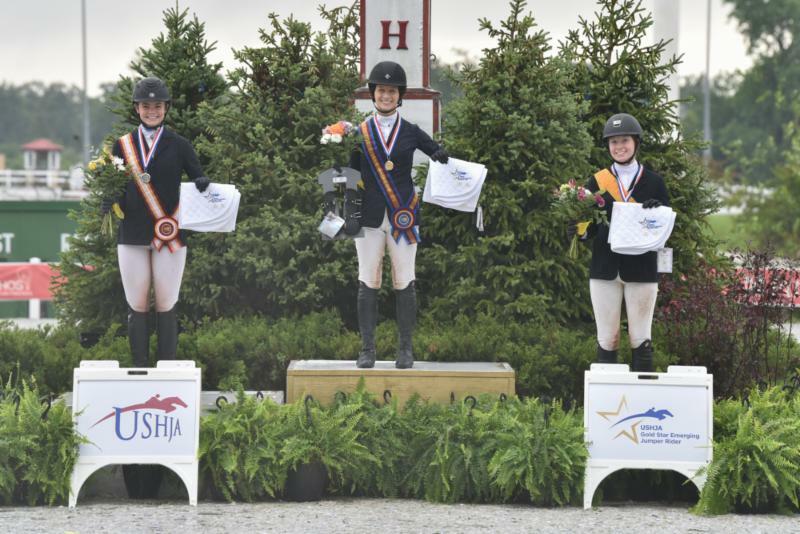 Lexington, Ky.--- --July 22, 2018 --- - The 2018 USHJA Zones 5 & 6 Jumper Team Championships riders didn't let the wet weather affect their fun this week as they gained experience, received medals and earned Gold Star Emerging Jumper Rider titles at HITS Balmoral Park. Six riders earned the Gold Star Emerging Jumper Rider title after securing their spots on the podium at the Championships. Anika Pirkle, Elese Kirby and Molly Struve, all from Zone 5, were individual medalists in the 1.20/1.25m Junior/Amateur section. Pirkle finished on zero faults after a speedy First Individual Qualifier on Friday that put her more than 10 seconds in front of the competition. Kirby earned the silver medal with just four faults over four rounds, and Struve earned the bronze medal with eight faults over four rounds. "It makes me really, really happy that he was able to perform so well for me," Pirkle said about her horse, Just A Dream, who is an off-the-track Thoroughbred she's been working to bring up the ranks. "At times I didn't get him to the best distances, so being able to have a bond as strong as me and him have, it just makes me happy." Kirby, who has had a busy week with college orientation and the Championships, was proud of her horse, Centomani. "This weekend was really fun, despite all the rain," Kirby, who earned the silver medal, said. "[The weather] was not the best, but we actually ride our best in the rain." Molly Struve, who helped secure the gold medal for her team on Saturday, came in ready to go with her horse Aurora on Sunday to earn a clean round and the bronze medal. "The round today went really well," Struve said. "It's four rounds so you don't really know how tired they're going to be...Pat [Boyle] did a really good job with the footing. The horses ride great on this." Phoenix Cooke (Zone 5), Kate Cote (Zone 6) and Claire Stockard (Zone 5), earned the top spots for the 1.10/1.15m Children's/Adult Amateur Individual Championships. All three finished on zero faults over the four rounds with Cooke edging out the competition by just a couple of seconds because of her time in Friday's First Individual Qualifier. Stockard, who earned the bronze medal, has a new partnership with her horse Canturada Seconda Della Caccia. "I just got her in March and we haven't been to too many horse shows together yet," she said. "This has definitely been her best one. We rode really consistently here. She's really good about the rain and everything." "I couldn't have asked for a better day today," Cote, the silver medalist, said about her horse Kaskada's performance. "She was awesome." Cooke was impressed with the Championships as well as her horse Skys Burnin Blue, an Appendix, and how she performed over the four rounds. "I got her just after my mom passed away, and we've built a really special bond together. It's been really fun together, and she's taken me places I could have never imagined," Cooke said. "This was a huge goal of mine this year." Individual gold medalists went home with Professional's Choice Pro Performance Show Jumping Boots and championship coolers. The 1.10/1.15m Adult Amateur Jumper Individual gold medalist also received Parlanti paddock boots for her efforts. Excitement was in the air for the Team Championships on Saturday. In 1.10/1.15m Children's and Adult Amateur Team Championship, Zone 6's Kate Cote, Anne Meyer, Henry Moberly and Rebecca Stamm took home the gold medal. Zone 5's Adeline Cordin-Blitstein, Claire Stockard and Edie Wetzel earned silver. Zone 5's Tyler Anderson, Clara Ciancuillo and Jacob Harris earned bronze. Zone 6 Chef d'Equipe Janine Weatherby was excited for her team and their performances in the Championship. "Zone 6 was phenomenal," she said. "All four had double clean rounds. They had a great time; they supported each other. It was a lot of fun!" The Zone 5 team of Kelbee Miller, Katherine Savarise, Natalie Schaffer and Molly Struve took home gold in the 1.20/1.25m Junior/Amateur Championship. It was Struve's clean round that prevented them from going into a jump off with the silver medal team of Emily Clemens, Michelle Jensen, Breah Mortenson and Anika Pirkle, the combined Zones 5/6 team. Elese Kirby, Ashley Miles, Ponce Tidwell, III, and Isaiah Wiseman, from Zone 5, took home bronze. 1.20/1.25m Junior/Amateur Team Medalists. Photo credit: Kristin Rover/USHJA. "I thought the 1.20 division was a nail-biter," Zone 5 Chef d'Equipe Elaine Schott said. "It was really exciting. I thought everyone got into the excitement of the intense competition." Schott said the camaraderie of the team championships also amps up the excitement. "Nobody at this level is used to or familiar with being on a team; it takes the individual out of the sport. I think participating on the team changes the complexion of the competition; you not only want to do well for yourself but for your teams." Danny Foster designed the Championships courses throughout the competition, and both riders and chefs were impressed with the tracks. "It was tricky; it was a very technical course," Cooke said about the Individual Championship course. "The bending line to triple. I really appreciate the technicality of the course and the challenge that came with it." "I thought the course rode really well," Elaine Schott said about the Team Championship course. "It asked a lot of questions. It required you to ride it and everybody rose to the occasion." 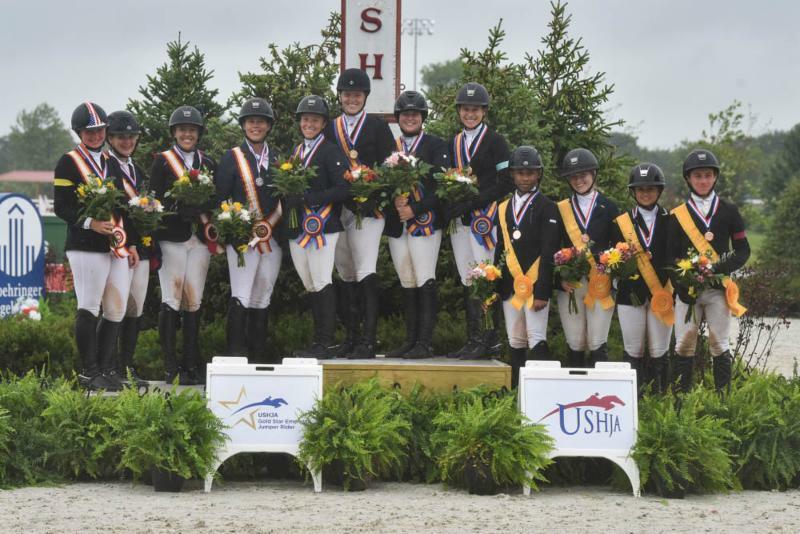 USHJA extends special thanks to Pat Boyle and the entire HITS Balmoral Park and Showplace Productions teams for hosting these Championships. 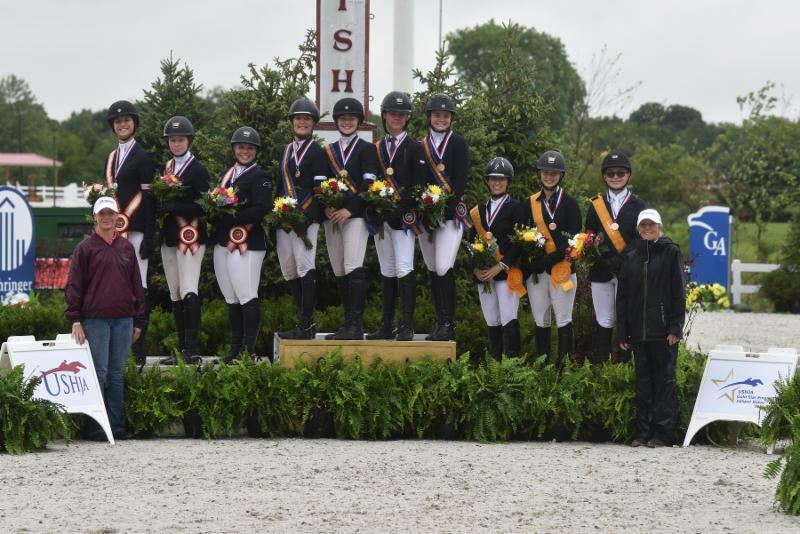 USHJA also thanks Zone 5 Chef d'Equipe Elaine Schott and Zone 6 Chef d'Equipe Janine Weatherby, who led the teams at the Championships.